Marcus Law knows Kettering Town will find themselves in “a good position” if they can clinch victory in tonight’s (Tuesday) huge top-of-the-table clash with Stourbridge at Latimer Park. One of the biggest games of the season so far in the Evo-Stik League South Premier Division Central sees the table-topping Poppies take on the team who sit immediately below them on goal difference. Law’s team maintained top spot thanks to a 1-0 victory at another of the high-flyers Royston Town at the weekend as Dan Holman’s first league goal for the club proved decisive. But the tough tests just keep coming and, with Kettering having two games in hand on their nearest rivals, a win this evening would see them in a commanding position at the summit. “There’s no doubt they (Stourbridge) are going to be right up there challenging and obviously we hope we are as well,” Law said. “If we can pull off a result then it will certainly put us in a good position and a draw is probably more detrimental to them than it is to us. “But we are confident at home. We haven’t had many home games recently and it will be good to get back there and see what we can do. “The boys are buoyant but they are just focused on each game. 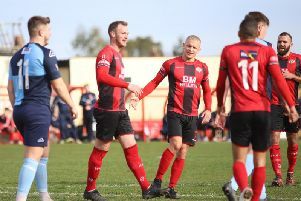 The two teams have already met once this season with Kettering sealing a 2-0 victory over the Glassboys in the first qualifying round of the Buildbase FA Trophy at the end of last month.